This is another fantastic installation in Susan Mallery’s Fool’s Gold series. Madeleine Krug climbs outside her comfort zone to plan a wedding for the sister of famed Jonny Blaze. Jonny is happy to meet her – and spend time with someone who doesn’t glom onto him for his star status. As they work together, their relationship changes and deepens. Madeleine and Jonny together develop from platonic to romantic … in a nice, gradual, believable way. 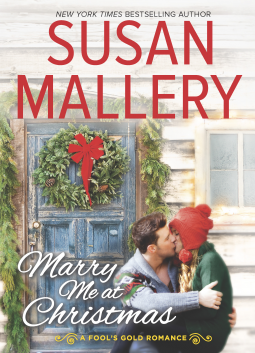 Besides the love story, Mallery shows us the overwhelming Christmas spirit Fool’s Gold offers. I celebrated right along with the sidewalk strollers and cocoa sippers, listening to carols and looking at the sparkling lights. From the sense of community and close friendships to the welcoming embrace given to newcomers, the people of Fool’s Gold are the perfect backdrop for Madeleine and Jonny to grow as individuals and a couple. And as usual, Mayor Marsha is the one to make things happen – for the good of the town, and for the good of romance!